At Williams Automotive Wangaratta, we pride ourselves in using top quality Australian branded products made to withstand Australia’s harsh climate. 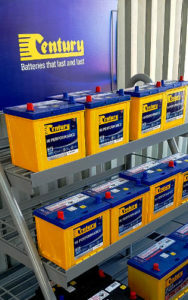 Century batteries are our choice of battery supplier and they are Australia’s oldest and most recognised battery manufacturer. Century started trading in 1928 and have built the company to huge levels due to producing fantastic products this helps keep our customers engines started. We have a wide range of car batteries in stock and they all come with a 24 month guarantee. Whatever car you drive, if you are experiencing battery problems our mechanics can help call us for an over the phone quote and keep in mind we never charge for fitting and you walk away with a class leading warranty.